Everything Roy Goble needed to know, he learned in a junkyard, where he grew up working with his dad. 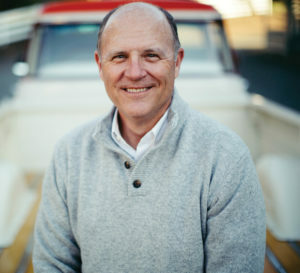 Since that time, Roy has taken over his family’s real estate business, co-founded a missions organization, and resided on several non-profit boards, including Westmont College, The Freedom Story, and The De Pree Center. His writing journey began—and continues—with a blog, where he shares insights for business leaders and wealth creators about following Jesus. He is the author of two books, Junkyard Wisdom and Salvaged (NavPress, January 2019). A native Californian, Roy is married to his high school sweetheart. They have two grown children. The Author and Creator of our lives will often throw in a twist that blesses us more than our original plan. Have you ever experienced such a “Divine Detour”? I headed off to college with intentions of being in vocational ministry and swore I’d never go into the family business. On my first summer break, I interned at a church and found out just how lousy I was at the job! By my third year in college, I had come full circle and found myself drawn to business, and I joined our family business the day after graduation. Definitely a “Divine Detour” that was exactly the right direction for me. What started you on your personal mission to encourage others? Growing up in a junkyard meant being surrounded by a fascinating cast of characters. It was tempting to view them like we viewed the cars we tore apart — having more value in parts than in whole. But it became evident that if I valued them as whole people, with hopes and dreams and needs, they’d grow personally and as employees. 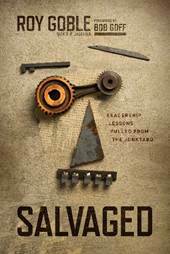 Let’s talk about your new book, Salvaged. What do you most want it to accomplish? There are so many people working hard and doing great things every day, which is the essence of what it means to be a leader. Yet they do not feel valued because they aren’t in the C-Suite, where they think all the decisions are being made. I hope those folks read this book — and the folks in the C-Suite read this book — so we can stop making leadership so complicated and get down to the actual work of it. Are there other important takeaways? I don’t expect people to build a homemade bazooka like I did, but I do hope they start to look for creative ways to “aim high” in their leadership. I hope they start to find leadership lessons in the most common things around them. I hope they start to see real points of connection between their daily lives and the stories in the Bible (though of course without the flamethrowers). Everything Roy Goble needed to know, he learned in a junkyard, where he grew up working with his dad. What do you believe to be the most important quality of a leader? Pointing people to Jesus. I don’t necessarily mean in an evangelistic way, which is sometimes very complicated in a work setting. But we can still be the salt, the yeast, that draws people to the heart of God by offering a set of values, goals, hopes and dreams that are rooted in our relationships. Is there a Bible passage or story that best describes your personal journey of faith? As the owner of a small business, I’m drawn to the centurion who asked Jesus to heal his servant (see Luke 7:1-10). The centurion describes the men under his command receiving clear direction, then responding with trustful urgency. Jesus honors the centurion for modeling faith, of course, but also for creating this kind of loyalty as a leader, and I’ve always striven to do the same. Thank you, Roy. It’s nice to have you as a guest at Divine Detour. For more information about Roy, visit his website, Junkyard Wisdom, or follow him on Twitter.